The piece “Malawi learns from Marikana tragedy” featured below was initially published in Malawi’s Mining Review Issue Number 26 2015 that is circulating this June 2015. Malawians had an opportunity to discuss problems dogging the mining sector in the country in comparison with the South African situation which saw 34 striking workers killed by the country’s Police at the Marikana Platinum Mine in August 2012 when they watched a documentary film [Miners Shot Down] of the tragic event and participated in a panel discussion. The function, broadcasted live on Zodiak Broadcasting Station and TV courtesy of Civil Society groups Actionaid and Citizens for Justice, was held at Crossroads Hotel in Lilongwe on May 22 with funding from Tilitonse Fund through the Responsive Mining Governance Project. The panelist included William Nyirenda of Actionaid representing the civil society, Inkosi Mwabulabo of Mzimba representing the local community, South African mine worker at the Marikana Mine Mxoxolo Magidiwana, Firm Director for Uhuru Productions which came up with the documentary Rehad Desai and Consultant in Film Production Michael Phoya. The organisers said the aim of the event was to enhance the understanding of the general public on mining governance issues, enhance the understanding of different stakeholders including the general public on how to respond to injustices in the mining sector and discuss how films can be used to document and drive discussion on mining governance issues and justice in Malawi. 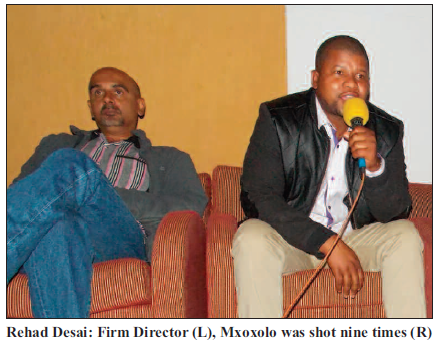 During the panel discussion, Desai advised Malawians to promote engagement among stakeholders including the Government, mining firms and civil society groups in order to avoid tragedies such as Marikana. In his turn, Nyirenda noted that Malawi has a lot to learn from the South African situation because though its mining sector is small and young, the country is already witnessing conflicts pitting communities on one hand and the government and mining investors on the other hand. Traditional Authority Mwabulabo, whose area covers the Kanyika Niobium Deposit being pursued by Australia’s Globe Metals and Mining, proposed that the award winning film be shown in rural areas where communities are exposed to dangers of unsustainable mining practices. Magidiwana, who was shot nine times during the Marikana tragedy and stayed in a comma for six months, said it is imperative for Malawi to ensure that such a scenario does not occur in Malawi, which is developing its mining sector. Elyvin Nkhonjera Chawinga of Actionaid commented that the film brings a lesson to the country that it is the responsibility of every Malawian to make sure that mine workers are protected.